The new patch on 3/16/16 invalidates the old data from breeding since the ratio has been changed. New thread for discussion of findings, breeding results, progress, and other horse related issues. This is a breed predictor app that tells you what you should expect when breeding certain tiers and levels of horses. Note that this is based on data-mined data that has been floating around from Russia/Korea and so it may not be 100% accurate. It does, however, appear to be "very close" to reality. This is a list of all available horses and their statistics. 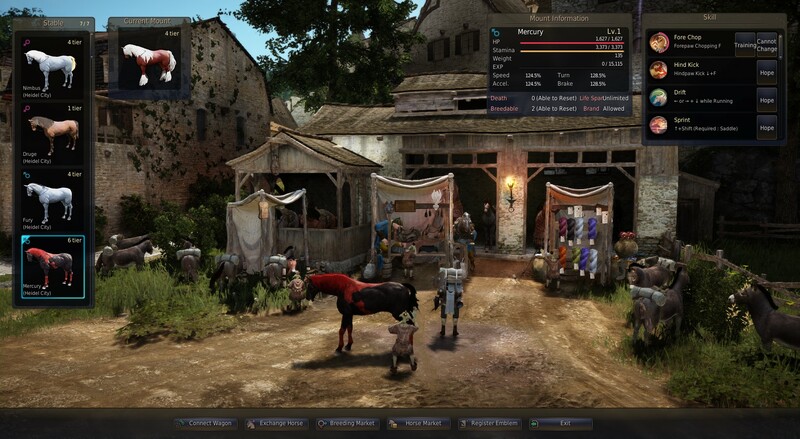 1) Does tier affect how much experience is needed to level up your horse? Yes. The higher the tier the more experience is needed to level up the horse. 3) Does tier affect the amount of skills, again also random depending on the horse, but does tier play a part in it? No conclusive answer to this. But based on breeders' personal experiences, training level seems to not have any effect. In fact, training level appears to do nothing at all. Perhaps in the future it will help tame higher tier horses. 5) Your Training level, does it affect how quickly 'unperfected' skills are mastered? No conclusive answer to this. Possibly so though. 6) What is the fastest way to level up a horse. 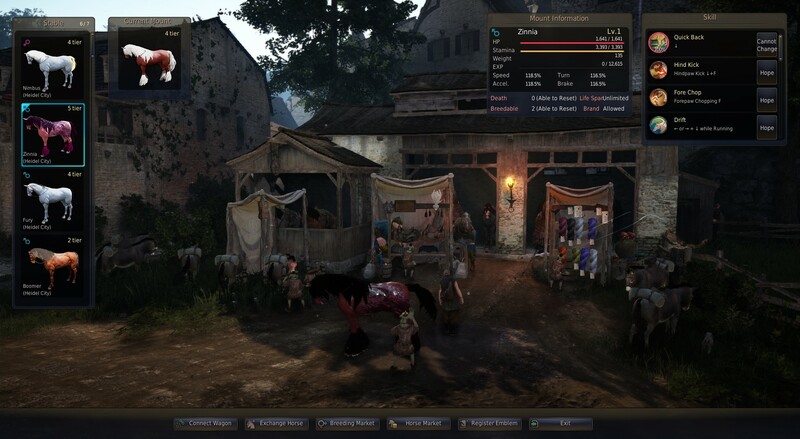 General feeling is that 4-horse wagon is faster than 4 horses single, but costly as an entire Noble Wagon will only take 4 T4 horses up to level 22 or so. It's going to take a couple of noble wagons to take T6s up to 30. Single horse riding is definitely most efficient if you're going to manually sprint. 7) Are the comqueror T5 horses crap for breeding? Yes, it appears so. They seem to breed as if they were T2 or T3 horses. Don't waste your time trying to breed them with high level horses. 8) Are T3+ horses in the wild yet? NO. Only T1 and T2 spawn and may be tamed. Posting this here as well so new people know at least T6 is possible. I'm a little behind given my horrific results from yesterday, but the new ratio should help get me back. I've only seen up to T2 so far and I caught ~8 horses so far since the patch and saw probably twice that in total. Yeah i don't know if it was the patch or not, is the foal generated when they go in for breeding or only when you go to initially retrieve the foal. If it was generated when they initially go in for breeding then it was on the old system, and if it is generated only when you try to claim the foal then it was on the new system. I've tamed what I've seen since maint and all T1s so no evidence of a T3+ in the wild from me. Its probably been asked a million times already but is there a cooldown or limit on how many horses you can exchange a day/whatever? I swear I had read there was but I can't remember and don't want to waste mine on T2's if there is. Exchange cooldown is supposed to be once per day. But then again the tooltip said one of the horses needs to have 1 breeding remaining but that is clearly not the case. I say try it and let us know. Ive tried it and it only lets you exchange once a day. Anyone else finding taming to be much easier? Only needed to use 2 ropes once now after a bunch of horses. May be in my mind though so thought I'd check here. All it costs you is some time, and 10 liters of mountain dew. Second breed results are in T5 Male. 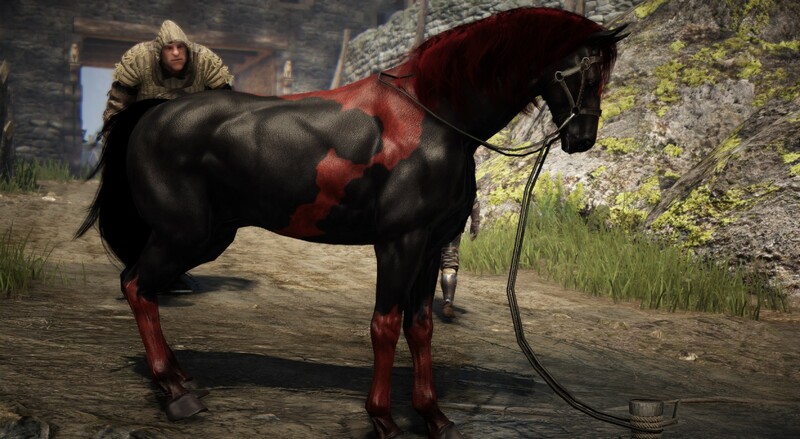 Wish it would of been a female T5, another T6 male likely wouldn't have been much help either, but this is the first T5 male i have that is not my Conq horse so i am happy about having one. Going to continue lvling up this second T4 female, to breed with the T4 male that is already lvl 30 when i reset its breeding attempts. Working on leveling some T3's to 20 or maybe 30 if I'm patient enough, will post results when I do! On that note, how does everyone here level horses? Is there a path you run to level yours? I've been running from Velia to Trent back and forth. Leveling my next t3 male now - excited to put them into breeding and see what I get! Preparing my lvl 11 T3 F....! Aww Well at least it's a gorgeous T5 and something that you needed. I'll keep my fingers crossed for you for your other breedings. I'm in the process of leveling some Tier 3's to 10 like a few others to see what it'll get me. More data to hopefully see just how much this patch changed the chances for higher Tiers.